During my search of attractions in Furano and Nakafurano, Biei has caught my attention when I saw astonishing landscape photos after clicking “images” tab in Google search. And since I’m already near the area, I didn’t want to miss the chance to see this. My Furano airbnb host once again offered me another package tour going to Biei since he was also going to Asahikawa in the afternoon. I wanted to ride a bicycle and just roam around alone but after reading some reviews, I realised it will be a little difficult for me since the hills are steep and I may really get lost as I am not familiar of the forks in the road. I may not be able to recognise the landmarks as they use trees, both number of and combination of it as indicators. The attractions were indeed very far from each other and biking will be very tiring unless you are really physically prepared. At first I was very insisting to my host to allow me to ride a bike, but after the whole day trip, I was more than thankful I listened to him – I had avoided my, if ever, worst bodyache of 2015. hehe. .
Biei is a very pleasant countryside bragging all the enchanting fields and rolls of hills. In winter, I imagined all the sceneries, as in everything is just white with a few houses with chimneys. Most businesses, like restaurants and shops, particularly those isolated like souvenir stores at the observatory park, or restaurants amidst the wide plantation of hops, are only open during summer and few weeks of autumn and spring, basically when the place is already out of meters-high snow. There is no dull view on my way from Furano to Biei as I have been fascinated by the mountains from afar. We visited first a popular public hot spring that caters both men and women combined in one pool (yes, all are naked at the same pool). Seeing naked men of same age as my dad actually felt awkward at first, hehe. .
on our way to the hot spring. strictly no taking of pictures at the spring so no naked old men for you. . hehe. . kidding. . but just look at how relaxing this green path is. .
Then we drove going to Shirahige waterfalls which is said to be supplying the water to the famous Biei Blue Pond. You can only view the waterfalls from a bridge; I’m not sure though if there’s a way, if they ever allow tourists to do so, to climb down and see this beautiful body of water nearer. The blue water in the stream plus the cold breeze made me more excited to see the Blue Pond. Next stop was the very enchanting Blue Pond. The amazing hue of the water as it contrasts the color of the trees around it is just magical. The water becomes greenish or bright blue depending on the weather; the pond owes it’s bright blue color to the natural elements and minerals, I guess coming from the nearby volcano Mount Tokachi, dissolved in the water like aluminum hydroxide (which I’ve read in some travel guide articles). Of course it freezes during winter so I think the best time to be enraptured by the pond is summer. 🙂 Don’t get me wrong, it’s just because this tropical girl just cannot stand the cold weather. I have seen photographs of the Blue Pond in winter where the thin bald trees are covered with cottony snow while the frozen pond water is still bright blue, it is as beautiful as in summer, and maybe better. well, hello there hairy little one. . i can say you’re cute but please don’t scare the crap out of me. . huhu. . what do you call the fear of caterpillars (or any creepy crawlies)? In between my Biei landscape photoshoot (trying hard to be a photographer, urgh! ), I had a cold soba from an isolated restaurant in the middle of the fields. It has many patrons that time but the place is very quiet. You can only hear the locals noisily slurping the soba noodles dipped in soba soup with radish and spring onions and condiment (soya sauce? I can’t tell actually) while classical music is softly played in the background. The boisterous slurping is Japanese style of eating and enjoying noodles and soup. 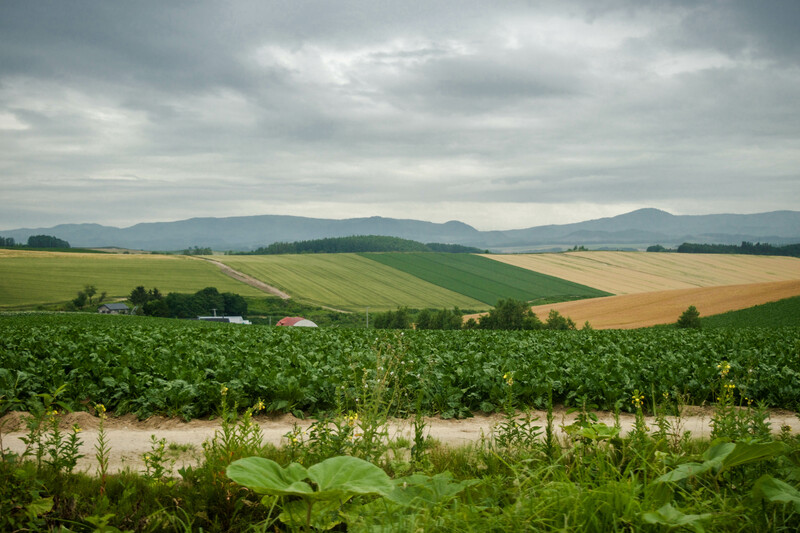 Most of my afternoon was actually spent admiring Biei’s Patchwork Road and Panorama Road where the popular trees and a scenic view of vast fields of hops, potatoes, etc, with a view of mountain rolls from afar captured me. These were the places where I actually wanted to wander in a bike and just get lost. The sights are way better than google images I saw and I’m sure my photographs can’t give justice to how really beautiful this rural town is. the Ken and Mary Tree has been popularised by a Japanese TV commercial. It has become a tourist attraction after the airing of the TVC. We then went to the Hokuseino-oka Observatory Park and I was more than amazed by the sight of vast landscapes. The view made me so tiny and thought that there’s so much place to see and wonders to discover in this world. There I met a photographer, Mr. Abe Sunichi-san selling his works; I instantly became a fan because his photos are just captivating. I, being a beginner in photography, admired his incredible eye to capture the best angle and his photography skills. I was humbled by this incredible photographer Mr. Abe Sunichi-san. We passed by Biei’s town proper and stopped for a while to buy some organic veggies and goodies to bring home. After the trip, my airbnb host just quickly dropped by Asahikawa for some personal stuff then we head back to Nakafurano to watch the fireworks. There was a festival but i was not able to understand what they were celebrating. What I know was that the next day was a holiday in Japan. It rained at night but the fireworks was pursued. Many people were wet but went home with a smile, amazed by thousands of rounds of fireworks in the sky. I went to my airbnb host’s other guest house, this time in Nakafurano, where I met other people, MS degree students from China but are studying in different parts of the planet, and had a beer with them. It was a fun night and meeting these wanderlust beautiful humans – Charles, Sonya and Hue Yi – was a pleasant bonus during my stay in Nakafurano. I had a good night sleep after a can of beer and lots of laughing and chitchats. I went off the next day, cleaned the room I rented and took the train going back to Sapporo. My airbnb host was out of sight the next morning, he is a very busy person so I just messaged him with the Japanese phrases I am most familiar with – “Arigatou Gozaimasu”. On the train, I looked back at my pictures and I was more than grateful I was able to see these beautiful creations of the world. A few tips if you plan to travel to Furano/Biei area. Hope this helps. 1. To check the train stations and arrival/departure time, I referred to Hyperdia.com website for the routes and timetable. It will also show you how much should you pay. 2. Train cars are separated for those who have reserved seats (of course you have to pay more if you do). If not, be ready to stand up in the other train cars during the whole >1 hour trip. 3. There are express trains operating from Sapporo to Furano only during certain season. So check with hyperdia.com the timetable. The express trains are not the fast ones like bullet trains in the main island of Japan though. 4. You don’t actually need a Japan Rail (JR) pass in Hokkaido. I think it is more economical to just buy the train tickets there and then. I didn’t spend $300 on my 5 day trip just for transportation in the northern island. 6. Hokkaido is known for its fresh seafoods, so sashimi and fresh sushi is a must try. I didn’t, urgh! I know, I missed the opportunity, but I was still scared to eat raw fish that time. . hehe. . But when in Furano and Biei, fruits and veggies shouldn’t be missed. It’s a farming haven, and melons and corns are so sweet. My adventures in Hokkaido continued in Sapporo.